On Friday, May 4, the juniors and seniors faced off in the annual Powder Puff game at lunch. The girls brought on their athletic abilities while the boys demonstrated their peppiness. 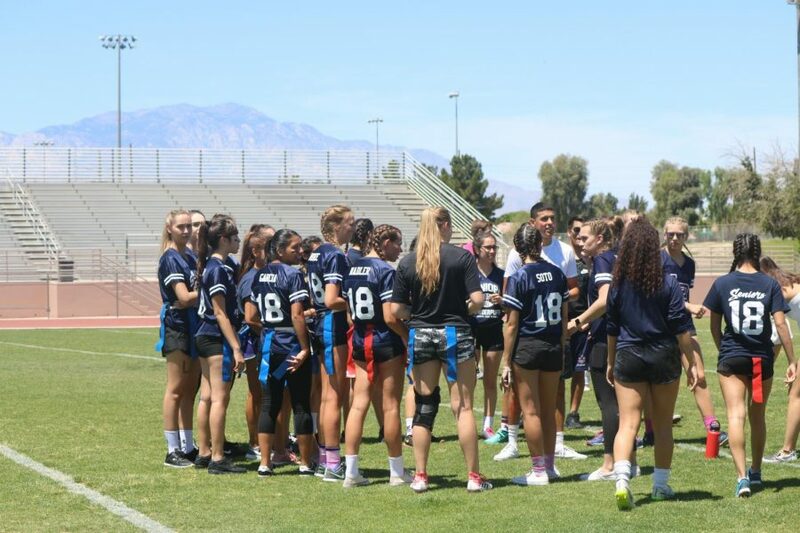 The powderpuff games allow for a unique opportunity for students to essentially switch gender roles, with boys taking on cheerleading positions from the sidelines and girls heading onto the football field. Many juniors and seniors love to participate and get involved since this is a once-a-year event. The seniors started off strong with a 20-yard catch on the first play of the game, followed by a 50-yard run from Alexis Garcia ‘18. Junior Shekinah Edwards responded with a 22-yard run; however, the score still remained at 0-0. “Any time I got the ball, all I thought I had to do was run because that is one of my biggest strengths,” said Shekinah Edwards ‘19. Edwards made several efforts to score, but was unsuccessful. The cheerleaders’ performance during the rally included a mix of songs, like “Circus” and “Breaking Free.” The male cheerleaders’ led familiar cheers, as well as unique stunts and flips. Powderpuff is known for being popular because of the cheerleaders, as many students find their performance entertaining. Although neither team scored, the seniors “claimed” victory, as they were the last ones with the ball. Edwards is in disbelief over this, as she is a junior but is eager to participating in the event again. “I had a lot of fun and I’m excited for next year,” she said.